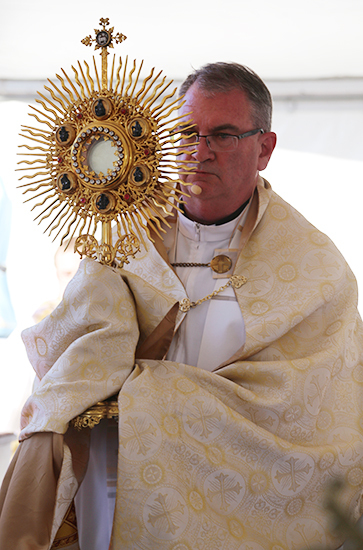 Cathedral dean Fr David Pascoe with the Blessed Sacrament during Benediction at the Corpus Christi procession. LET me ask you something: do you enjoy silence? I don’t know if it coincides with turning “the big 4-0”, as I repeatedly heard last year, or simply because the world is a noisy, confused place, but I have grown to love silence, even crave it. Adoration of the Blessed Sacrament is the major reason why, when and how. It’s such a beautiful use of time to sit with the Lord and lose myself in prayer, reflection, stillness and quiet. Of course having the time for adoration isn’t always possible; 100 things interrupt the very best of intentions. The more “time poor” we are however the more I crave the silence, crave the Lord. Essentially, the busier we are, the more I need the Lord in prayer and adoration. When I look back on the day, if adoration has been part of the equation, it’s always considered to be a day of time well spent. Last Sunday we celebrated the glorious Feast of Corpus Christi, the Solemnity of the Most Holy Body and Blood of Christ, and people of all ages gathered in prayer and adoration. There’s no doubt in my mind that the witness we give when we adore the Lord individually and collectively continues to draw others to the magnetism of Christ. In last Sunday’s case I’d suggest that applies long after the feast day itself. And what a blessing it is to adore the Lord with others. When we were given the extraordinary gift of perpetual adoration in our home parish, one of my daughters, home-schooled at the time, came along too. This time with the Lord and her was such a profound gift in itself. The influence on her daily perspective, actions and decisions too was profound. I admit her older sister took some time to “grow into” the silence and stillness. She taught me about the importance of guiding children through the discipline of stillness. It’s a discipline requiring constant modelling and, again, time well spent. Home now with Master Newly One is a blessed time of the day to be without what I call “electrical interference”. It’s when we can really “be”, often without words. There are parallels with this togetherness and time spent with the Lord in adoration. Yes, there’s far less stillness with Master Newly One but I find the attention I give him without interruption is such a grace, such a gift to us both. Of course there’s the regular bevy of chores to do but somehow, in the silence, even they become more manageable. Don’t get me wrong, I love seeing people and being in the world. It’s the balance I find so important. And so, when my parents-in-law arrived from overseas in recent weeks to live with us, our profound, daily periods of silence went out the window. They love to talk, talk, and talk some more and naturally, delighted in engaging with Master Newly One for the first time, face-to-face. Evaluating our very full and noise-filled days, they too have been well spent. Time together, when normally we are an Internet connection away, has been full of many graces. And so when I announced I’d be taking Master Newly One to daily Mass, as is our regular routine when best intentions aren’t interrupted by electrical interference, my mother-in-law grabbed her jacket and flew out the door with us, without hesitation. Again, I reflected on the blessing of time with the Lord and with family members. In essence, I’ve long known giving time to God is not only time well spent but also produces the fruitfulness of allowing other daily schedules to be met. It amazes me just how much I can achieve every day when in fact, I am still and silent for a time with the Lord. It’s as though the more time I give to Him, the more beautiful is the noise, the productivity and the silence. Maybe there’s your answer too.